[4 mins. 40 secs.] 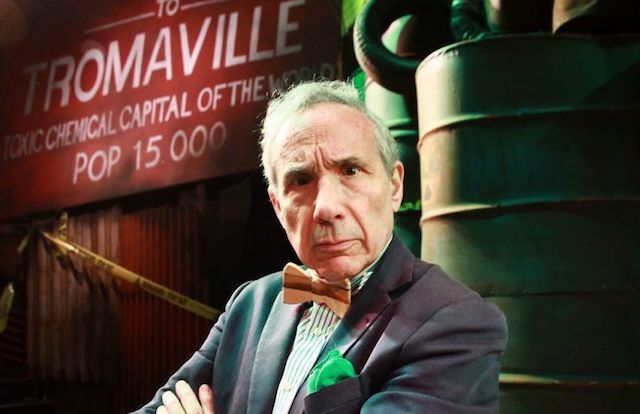 Lloyd Kaufman co-founded Troma Films with Michael Herz back in 1974. Troma is now the longest operating indie film studio in existence. I first got the notion to invite Kaufman on to the podcast when I saw him speak at the opening night festivities of the Queens World Film Festival back in 2011 where he accepted an award. Since than we've feuded extensively over Twitter. But for the sake of our mutual audiences we decided to lay rest to the Toxie/Waxie wars and come together for a follow-up conversation lo these past 5 1/2 years. You can hear Lloyd way back on Episode 56 where we recorded his first appearance at his Manhattan home. But in the 400 episodes that have elapsed, Kaufman has only gotten crankier and funnier as he continues to disrupt the worlds of film & media. Incidentally, the 8th annual Queens World Film Festival is taking place right now. Tickets are available for many of the screenings that will continue to run through the 25h of March. Please check it out and support great local film festivals like this one!